Skipton beat Otley 7 - 0, at Ilkley. John McIntyre is stood on the far left. He was a schoolboy at Ermysted's at the time, aged 18. He had trials for the Yorkshire and Cumberland county teams.He was training to be a teacher at St. John's in York when the war broke out in 1914. He served with the Gordon Highlanders, and the 2nd Battalion Green Howards as a 2nd Lieutenant. Unfortunately he was fatally wounded at the Battle of Loos, in France on 25th September 1915. He died in a German prisoner of war camp on 5th October 1915. To the left of the captain is Alex McIntosh, a senior master at Ermysted's and future headmaster. He was a county regular. 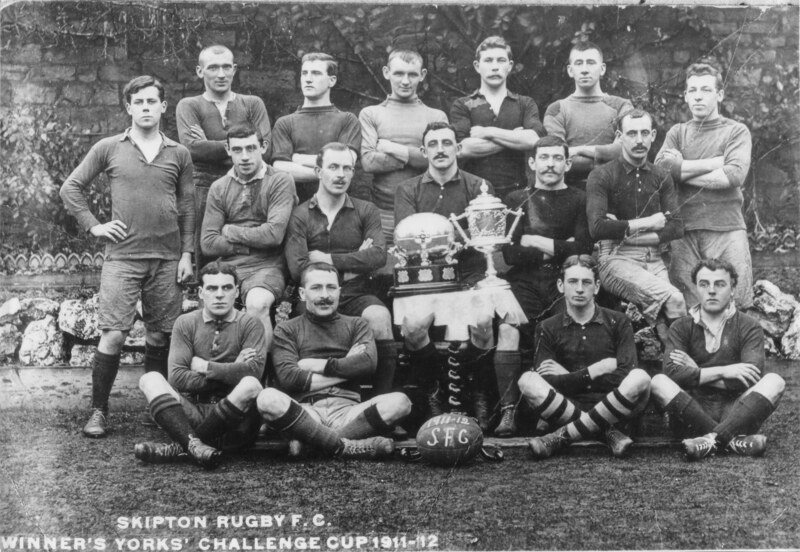 The team is Back Row.J.C.McIntyre, J.Pickard,J.Graham,W.Fletcher,P.Fields, S.Bishop.Middle Row,A.Lambert,A.McIntosh C.Tosney Capt.,A.Clarke,W.Scott,H.Blakey, Front Row.C.Thaites,W.Brayshaw,J.E.Gill, G.Fennerty.Alf Clarke played trombone with the Skipton Mission band.For big games he would march to the ground,play the game and then march back with them.